・For clinicians and basic researchers who deal with patients with voice disorders, it is imperative to listen to the patient’s voice and observe how the phonatory organs move. To obtain sufficiently clear perceptual ratings, examiners must share a common vocabulary and identical “ears.” The Japan Society of Logopedics and Phoniatrics has long promoted perceptual assessment using the GRBAS scale to evaluate hoarseness on as common a basis as possible. 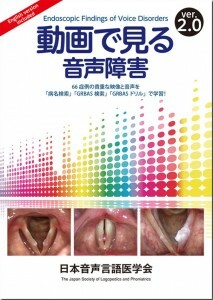 ・Listening to a voice, it is only natural for the specialist to want to know how the voice is produced: in other words, how the phonatory organs create it. This DVD makes such understanding possible. In this new edition, data pertaining to all cases (except No. 062) has been updated to reflect significant technological advancements in the field of endoscopy since the initial version of the DVD was produced in 2005. Now, much clearer images provide higher spatial resolution and greatly refined color.